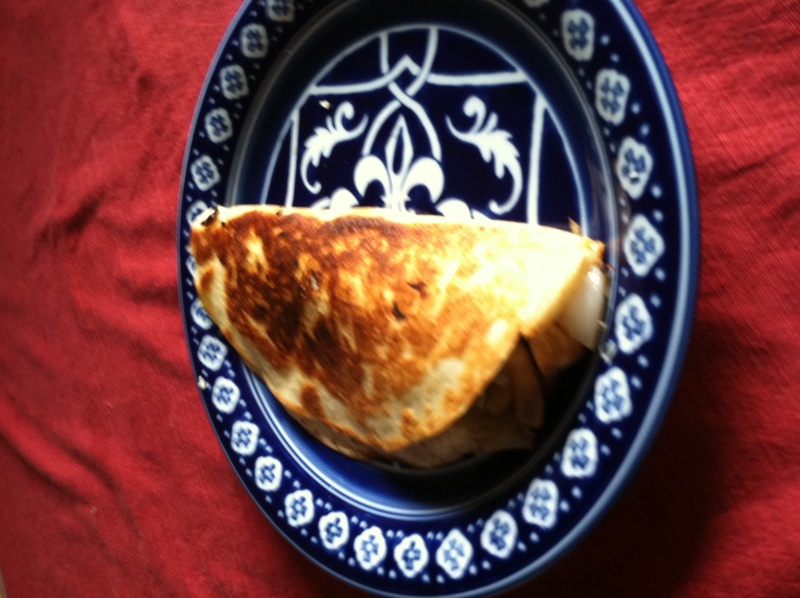 This is one of my favorite dishes to make: chicken, mushroom, and Gruyere quesadillas. I found this recipe in my parents copy of Cooking Light from July 2009. Luckily, it is posted online here. The “burrito” sized tortillas that I found at the supermarket were just the right size, my roommate and I each got one super filling quesadilla. In regards to the actual cooking, I personally like to double the amount of ingredients in the mushroom mix to have more filling. A precooked chicken would also be a way to make this recipe faster. I just grilled up some chicken on my little grill and shredded it with two forks. The tricky part of these is making sure that the insides don’t fall out into the pan while you are making the tortilla all crispy and quesadilla-like. I don’t really have an answer for how to fix that except go slowly and carefully. Also, watch the temperature of the pan, I burned mine a bit. If you are in the mood for quesadillas, this is a quick, tasty recipe.